Training for Youth Workers - Only $10! For those that don’t know, Social Inclusion Week kicks off this Saturday. Running from the 23 – 30 November, the week encourages individuals and communities to make connections with others – either personally, or through community based events. It aims to help all Australians feel valued and to give people the opportunity to participate fully in society. The week obviously aligns very closely with the values and mission of our organisation and each year, we try to support the week by hosting some events of our own. I would encourage anyone who currently works with young people with disabilities to get in contact and book a place in the training that we, along with YACWA, are offering to Youth Workers. This training focuses on including young people with disabilities in mainstream activities and, in a great alignment with Social Inclusion Week, aims to equip those that attend with knowledge on how to help young people feel valued and participate fully in society. I would also like to thank The Youth Affairs Council of WA for partnering with us on this event – I have said before that partnerships are an important part of how we work, and a partnership with YACWA has meant that the training will reach a much greater audience and hopefully, we will achieve some fantastic outcomes by working together. Do you work with young people in WA? 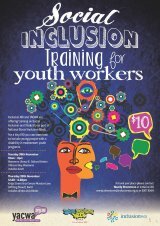 As part of Social Inclusion Week, Inclusion WA and the Youth Affairs Council of WA have teamed up to offer some fantastic training for Youth Workers. In August of this year, Inclusion WA hosted a youth consultation for the Commissioner for Children and Young People. The Commissioner, Michelle Scott, has recently released the ‘Speaking Out About Disability’ report, which summarises the findings from the consultations. The report provides a great insight into the issues that affect young people with a disability. Inclusion WA’s Ryan Creed reports on the Inclusion Sports Carnival held recently. Inclusion WA has produced some handy factsheets that you can download and use for yourself or give them to others. How do I find recreation activities in my community? How to approach or get involved in a community group or club. It's been a huge twelve months at Inclusion WA and you can read all about our year in the Inclusion WA Annual Report, which is now available to read online.